I started going to renaissance faires shortly after I got out of the Navy, after I met my wife. She’s been going to them since she was a child and was a regular performer at some of the ones in California for quite some time, going all the way back to the original Renaissance Pleasure Faire. The Tourist: The Tourist is a regular joe. He shows up in regular clothes and wanders around spending money, eating giant turkey legs, seeing the shows, and taking pictures. The vast majority of people at a renn faire are Tourists. The Costumed Tourist: The CT shows up in costume, but they’re not really in character. They’ve dressed up to show off or perhaps to just fit in a little better, but they’re still carrying their bottles of Bud Light and wearing sunglasses. The Rennie: Rennies are into it. They’ve got the costume, they say things like “thee” and “good day sir” and “milady, if it please you” with an appropriate accent, carry themselves like the urchin or fairy or cavalier they’re dressed as, and in general act a part in the theme of the faire. These are the folks that have spent hundreds of hours (and dollars!) to tweak and perfect their costume. The line between #2 and #3 is a pretty blurry one. At a faire you might see ninjas, monsters, knights in armor, Stormtroopers from the 501st, fairies, and a steampunk pirate gang. Some folks dress up in period-correct costuming but are just slumming, while those Stormtroopers are walking with weapons at the ready like they’re patrolling Mos Eisley. When I met my wife, she had a trunk full of costumes and a handful of personas she liked to play. I, on the other hand, was just a guy who liked to watch girls in corsets and chainmail bikinis. She tried to get me into it but I didn’t grow up with the faires like she did. Those periods of history never really interested me; we discussed character ideas and such but nothing ever really caught my interest. Eventually we ended up with matching costumes and she would turn the persona up to 11 while I would stand nearby with a stupid grin and manage a “thank thee” when I was handed change from a purchase. 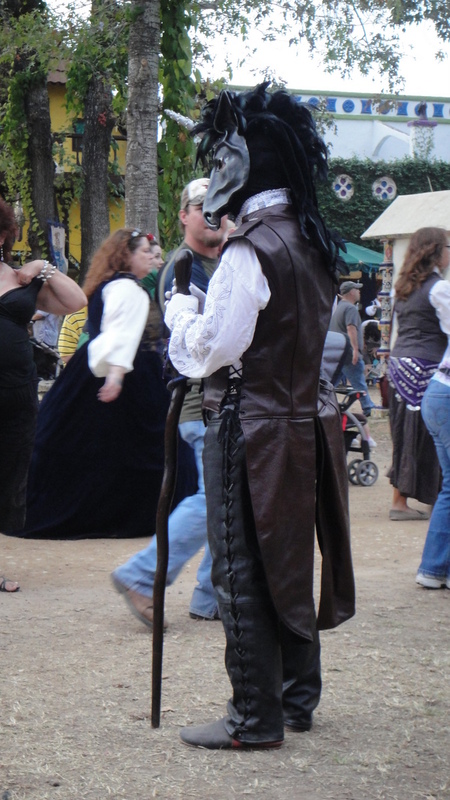 There are three renn faires that are close enough for us to attend: Sherwood Forest Faire, Scarborough Renaissance Festival, and Texas Renaissance Festival (the nation’s largest faire). One of the things we like to do is browse the artists and shops. There are some people who sell cheapo gaudy blades from BudK and crappy Chinese-made kitsch but the majority of vendors are some seriously talented people, handcrafting everything from clothing to soap and perfumes to jewelry. 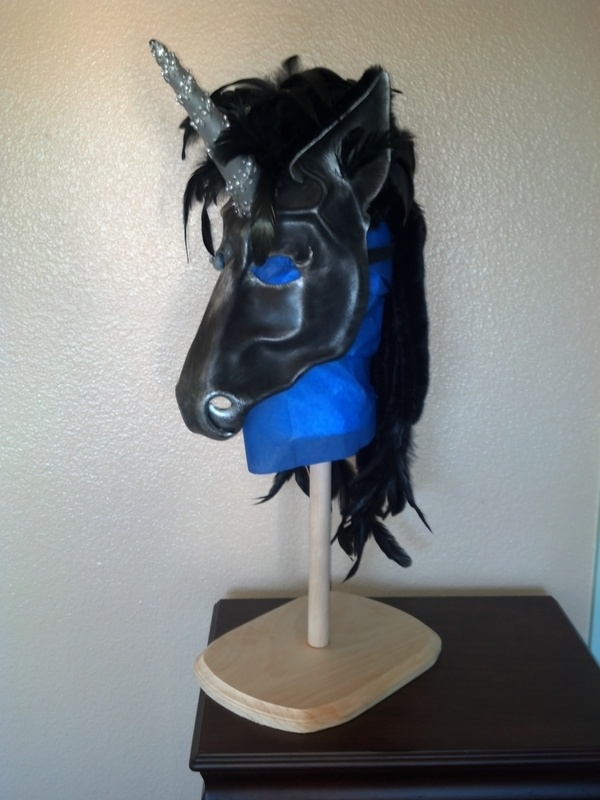 A few months ago, during the opening weekend of TRF, I happened across the Artsmyths shop and found the Mask. They had a lot of masks at the shop but this one caught my eye from yards away. It was a unicorn but it wasn’t the usual sort of frilly white unicorn most people associate with fairies and rainbows. 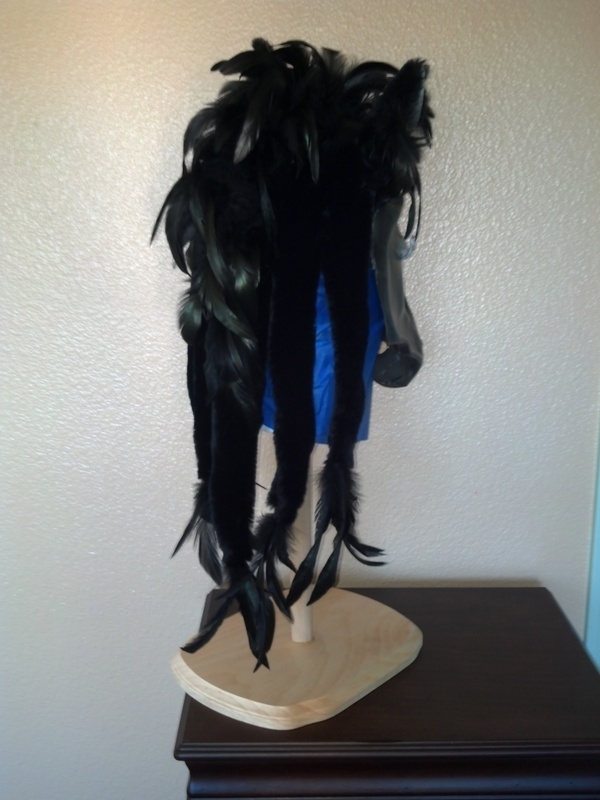 It was black with silver highlights, serious and masculine, staring down at me from a mannequin head. I’m always on the lookout for the unique and this practically had neon arrows pointing at it. I bought it on the spot. I didn’t have any plans for it beyond displaying it at home, but my wife quickly pointed out that it’d be a pretty good basis for a costume. 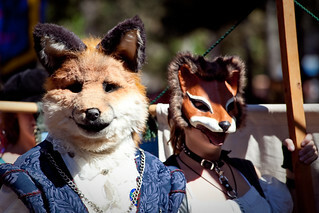 I’d long admired the costume of “Alphonse,” one of the “fox guys” who frequents the local renn faires. 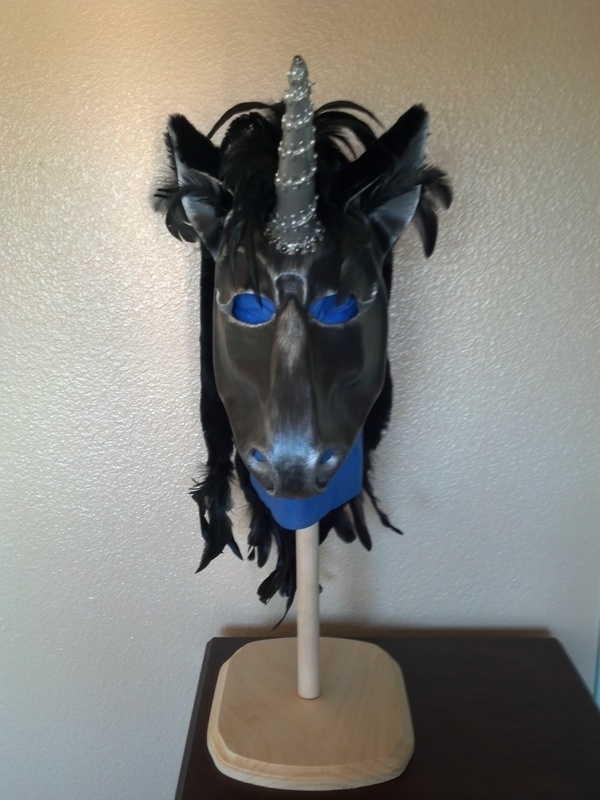 It’s a different sort of headpiece from the unicorn mask, a bit more realistic where my mask is more stylized, but the general idea was the same: dress up like a humanoid critter. I had the head, so why not give it a whirl and see what happens? I quit counting after 100. I felt like a goddamned rock star. Little kids would come running up to me. People would stop me to get their picture taken with me and a crowd would gather. Guys would high-five me. 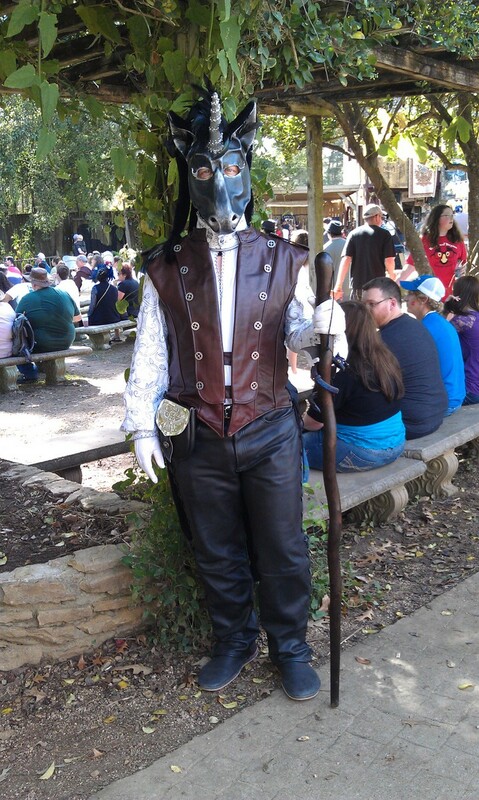 Some people asked me questions like I worked at the faire. Someone dressed up like some kind of nature spirit came up to me and started peering at me, in character, so I peered back until he “got scared” and ran off. At one point a gaggle of middle-school-aged girls surrounded me and started bombarding me with questions: Did unicorns live forever? Was I magic? Was it hot under my mask? (A lot of people asked me that, actually. No, it wasn’t.) As the day went on I had five requests to touch my horn and one request to dance Gangnam Style, all of which I politely refused. It was crazy fun and surprisingly empowering. Where I was self-conscious before when confronted with someone else acting in character, now I could be bold, respond, play along, even be the one who started things with others. The Mask gave me the protection of anonymity, letting me play without fear of being judged, while it presented my persona to everyone else. I had more (and better) interactions and more fun in that one eight-hour period than in all the other times I’ve gone to renn faires in the last decade, combined. So, my little experiment was a fantastic success. Every character deserves a name and I’ve picked “Tynan,” which the internet tells me is a Gaelic name that means “dark.” Seems a fitting name for a black unicorn. Plans are in the works to flesh out the rest of the costume over the next several months with hooves, a tail, and some more appropriate clothes. Sherwood Faire got underway last weekend and I’ll be going as Tynan this Sunday. Fun times ahead!